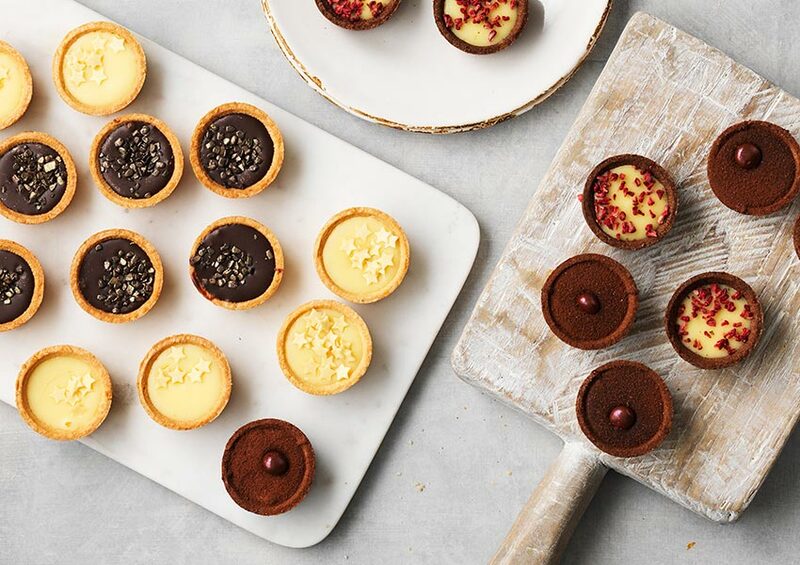 A selection of mini fruit tarts including passion fruit curd, raspberry jam, cherry jam & salted caramel, all finished with a silky smooth chocolate. 6 all butter pastry cases, filled with tangy passion fruit curd and topped with a lemon and white chocolate ganache, decorated with white chocolate stars. 6 all butter pastry cases, filled with a layer of buttery salted caramel and topped with Belgian chocolate ganache, decorated with gold sparkle chocolate pieces. 6 all butter pastry cases, filled with a tangy raspberry jam and topped with a white chocolate ganache, decorated with dried raspberry pieces. 6 all butter pastry cases, filled with a Morello cherry jam and topped with Belgian chocolate ganache, decorated with chocolate shortcake balls. Fortified Wheat Flour (Wheat Flour, Calcium Carbonate, Iron, Niacin, Thiamin), Sugar, White Chocolate (16%) (Sugar, Cocoa Butter, Whole Cows’ Milk Powder, Skimmed Cows’ Milk Powder, Emulsifier: Soya Lecithin; Flavouring), Butter (Cows’ Milk), Glucose Syrup, Free Range Egg, Double Cream (Cows’ Milk), Passion Fruit Puree (2%),Water, Palm Fat, Cocoa Butter, Cornflour, Cows’ Milk Powder, Glycerine, Acidity Regulator: Citric Acid; Emulsifier: Soya Lecithin, Sunflower Lecithin; Lemon Concentrate, Gelling Agent: Pectin, Agar; Concentrated Lemon Juice, Colour: Mixed Carotenes, TitaniumDioxide, Iron Oxide; Salt, Lemon Oil. Fortified Wheat Flour (Wheat Flour, Calcium Carbonate, Iron, Niacin, Thiamin), Sugar, Belgium Milk Chocolate (14%) (Sugar, Cocoa Butter, Whole Cows’ Milk Powder, Cocoa Mass, Emulsifier: Soya Lecithin; Flavouring), Butter (Cows’ Milk), Belgium Dark Chocolate (8%) (Cocoa Mass, Sugar, Cocoa Butter, Emulsifier: Soya Lecithin; Flavouring), Glucose Syrup,Water, Skimmed Cows’ Milk, Cream (Cows’ Milk), Free Range Egg, Palm Fat, Cocoa Mass, Invert Sugar Syrup, Emulsifier: Soya Lecithin, Mono- and Diglycerides of Fatty Acids; Muscovado Sugar, Cocoa Powder, Salt, Cows’ Milk Fat, Gelling Agent: Pectin; Lactose (Cows’ Milk), Colour: Potassium Aluminium Silicate, Titanium Dioxide, Iron Oxide, Flavouring. Fortified Wheat Flour (Wheat Flour, Calcium Carbonate, Iron, Niacin, Thiamin), White Chocolate (17%) (Sugar, Cocoa Butter,Whole Cows’ Milk Powder, Skimmed Cows’ Milk Powder, Emulsifier: Soya Lecithin, Flavouring), Butter (Cows’ Milk), Glucose Syrup, Sugar, Raspberry Puree (6%), Double Cream (Cows’ Milk), Free Range Egg, Dried Raspberries (3%), Cocoa Powder, Palm Fat, Glycerine,Water, Emulsifier: Soya Lecithin; Gelling Agent: Pectin; Acidity Regulator: Citric Acid, Sodium Citrate. Fortified Wheat Flour (Wheat Flour, Calcium Carbonate, Iron, Niacin, Thiamin), Glucose Syrup, Belgium Milk Chocolate (14%) (Sugar, Cocoa Butter, Whole Cows’ Milk Powder, Cocoa Mass, Emulsifier: Soya Lecithin; Flavouring), Sugar, Butter (Cows’ Milk), Morello Cherry Puree (9%), Belgium Dark Chocolate (8%) (Cocoa Mass, Sugar, Cocoa Butter, Emulsifier: Soya Lecithin; Flavouring), Free Range Egg, Cows’ Milk, Colour: Potassium Aluminium Silicate, Iron Oxide; Invert Sugar Syrup, Cocoa Butter, Emulsifier: Soya Lecithin; Cocoa Mass, Skimmed Cows’ Milk Powder, Lactose (Cows’ Milk), Whey Powder (Cows’ Milk), Cows’ Milk Fat, Flavouring, Acidity Regulator: Citric Acid, Sodium Citrate; Wheat Gluten, Salt, Raising Agent: Sodium Hydrogen Carbonate, Ammonium Hydrogen Carbonate; Stabiliser: Guar Gum; Sucrose, Honey, Ethanol.